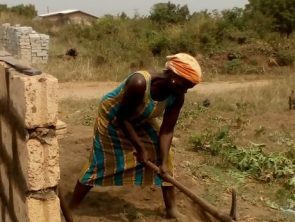 One of the ladies working on clearing the land for the wall (click on the image to view more photos). It is the desire of every church to properly house the pastor in charge. It is usually preferred to have the pastor stay close by the church premises because of its relative advantages such as easy access to the chapel and the pastor’s availability to the church members at all times. This is one of the reasons why The Higher Glory House Church has decided to build a mission house (parsonage) alongside the main church structure. Even though the normal reasoning would have been that since funding for the main church structure is very scanty and hard to come by, all available funding should be channeled to the main structure to get it to a respectable level before considering any other project. Indeed, the priority at the moment is to putting up the church structure but it has also become necessary to consider building the mission house (parsonage) as well. Two main factors accounted for this decision to be taken. Working on laying bricks for the wall (click on the image to view more photos). The first was that Pastor Padi’s rent has expired for his current accommodation which is very close to their place of the school where the church worships now. Instead of raising funds to rent another apartment (house owners usually take two years rent advance) the church deems it fit to invest it such money rather in the building of a parsonage. The proposed mission house would be a three bedroom with a hall and kitchen apartment would be done in phases. 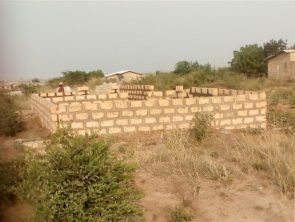 The first phase is to complete and roof 1 bedroom, hall and kitchen within the shortest possible time to temporary accommodate the pastor and his family and also serve as a place where the church properties such as plastic chairs, musical instruments and sound systems could be kept. Currently Pastor Padi keeps all these in his apartment and conveys them forth and back to the meeting place every Sunday. building the parsonage alongside the main church structure. Part of the wall completed (click on the image to view more photos). 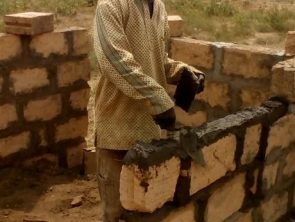 Pastor Padi and his family as well as many church members have committed themselves to provide both skilled and unskilled labour to complete the first phase of the parsonage. Church members in their own small way continue to contribute towards the project. 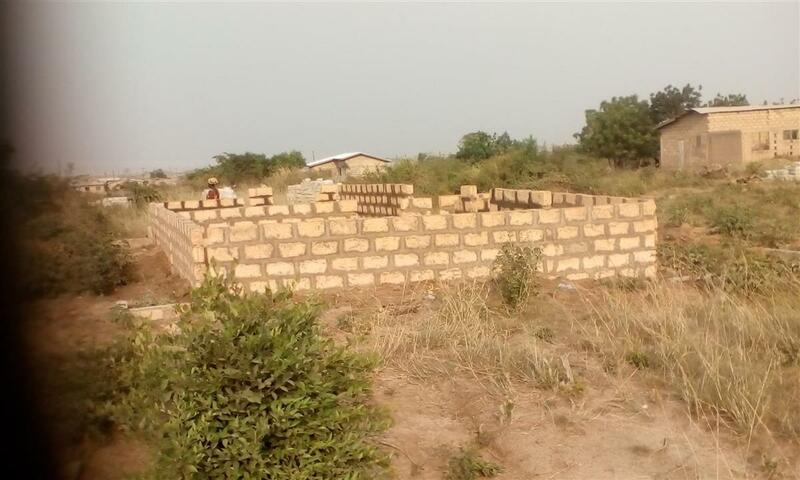 It is our hope and prayer that the first phase of the project would be completed by the end of March 2018 just in time for the pastor to assume residence in April when it would be expected of him to quit from his current accommodation. It Is My Prayer That The Lord Through His Goodness And Mercies Help His People To Be Successful.